Home / Equinesport Veterinary Manual, second edition. 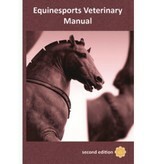 Equinesport Veterinary Manual, second edition. The Equinesports Veterinary Manual (200) discusses the pharmacokinetics of equine medication available today and the international regulations. It advises on the therapeutic effects. The consequences these substances may have on withdrawal times for competition. It explains and discusses the most relevant international competition regulations of the international regulatory bodies (FEI, IFHA, IFAHR, FEQHA, AQHA, ARCI, USEF, CPMA, WADA), laboratory outcomes (EHSLC, RMTC, AORC) and the European policies on veterinary medication. In this edition we have also elaborated on the regulations and risks concerning nutritional supplements. The Equinesports Veterinary Manual is meant for those veterinarians and other equine professionals involved in the management of competition horses.